A study led by UT Southwestern Medical Center researchers has uncovered key molecular pathways behind the disruption of the gut's delicate balance of bacteria during episodes of inflammatory disease. "A deeper understanding of these pathways may help in developing new prevention and treatment strategies for conditions such as inflammatory bowel disease (IBD) and certain gastrointestinal infections and colorectal cancers," said Dr. Sebastian Winter, Assistant Professor of Microbiology and a W.W. Caruth, Jr. Scholar in Biomedical Research at UT Southwestern, who led the study. 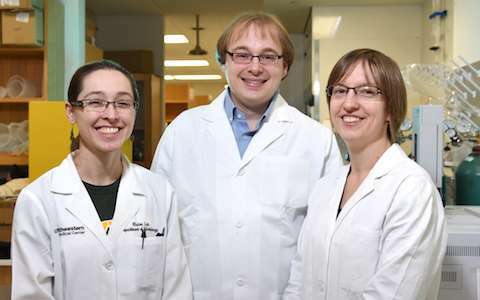 "We found that gut inflammation correlates with a change in the nutrients available to the bacteria," said Elizabeth Hughes, a graduate student in the Winter Lab and co-first author of the study. A healthy human gut is teeming with microbes, with bacterial cells outnumbering other cells in the body by 10-to-1. For most of a person's life, these microbial communities, or microbiota, facilitate digestion, protect against infections, and orchestrate the development of a healthy immune system. During episodes of intestinal inflammation - which can occur during IBD and gastrointestinal infections and cancers - the composition of these gut microbial communities is radically disturbed. "Beneficial bacteria begin to dwindle in numbers as less beneficial, or even harmful, bacteria flourish," said Ms. Hughes. "This imbalance of microbiota is believed to exacerbate the inflammation." "Inflammation changes the environment so that it is no longer perfect for the commensal anaerobes, but perfect for opportunistic E. coli, which basically wait for an 'accident' like inflammation to happen," Dr. Winter explained. The increased availability of oxygen during inflammation helps E. coli thrive in an inflamed gut through a metabolic "trick," Ms. Hughes said. "Through respiration, the abundant waste products generated by the beneficial microbes can be 'recycled' by commensal E. coli - which do not grow well on fiber - and turned into valuable nutrients, thus fueling a potentially harmful bloom of the E. coli population," she explained. Learning more about the forces behind disease-related shifts in the gut's bacterial composition provides insights into treatment targets and diagnostic resources. This understanding could lead to more effective treatments for IBD and inflammation-associated colorectal cancers. New drugs might, for example, inhibit this particular metabolic function of E. coli. "If we interfere with the production of waste products by the beneficial commensal bacteria, then we impede their metabolism, which causes them to grow more slowly and throw off the entire ecosystem," Dr. Winter said. "The most effective strategy may be to inhibit commensal E. coli's unique metabolism to avoid the bloom and negative impacts."